Reog is a traditional dance that become the main identity for Ponorogo regency. Because of this, Ponorogo is also known as Reog city. This theatre has been known wide in Indonesian even foreign tourists. Reog National Festival is held every years along the anniversary of Ponorogo regency and Grebeg Suro celebration. Reog told about the struggle for a prince who will propose to a lovely pretty princess . This dance is staged about 25 - 40 dancers and the musician. 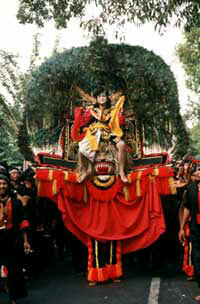 The interesting of Reog is his main leading figure named Singo Barong. The dancer of Singo Barong bear the mask about 30 - 40 kg weight and supported by the strength of their teeth. The other leading figure in Reog include Kelono Sewandono, Bujang Anom, Jatil and Warok. The visitors can enjoy this traditional dance only in Ponorogo, East Java - Indonesia. The only area that has REOG dance is Ponorogo, not in other country. Is the biggest culture event in Ponorogo regency that held on a certain occasion of welcomed Islam New Year or Saka New Year that often known as one suro date (one of Javanese month). This agenda entered East Java tourism calendar (Calendar of event). 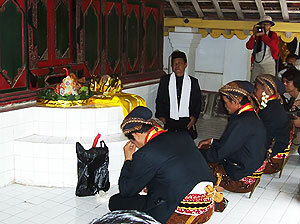 Grebeg Suro is the ritual culture incident and became the party site of Ponorogo people. Usually it begun a week before 1 Suro. It is the series of Grebeg Suro agenda is Reog National festival, various good activity sorts the race and the exhibition and ended with Larungan agenda in Ngebel lake. The parade of the elephant statue that consist of the musical procession and the elephant statues. Those statues have received by human kind and climbed onto by two children. This art is has influenced by Islam culture. Musical Art that influenced by Islam performance art, usually staged at the wedding reception or circumcision. Art that combined the element of the dance and traditional music. This art is usually staged by less than 10 people of gamelan beater and the dancer, the interesting one from this art is its musical instrument that formed blown big bamboo.